Set your S550 2015 Mustang Ecoboost off with this 100% stainless steel Street Catback exhaust system from Magnaflow! Not only will you gain that true, smooth, deep sound, but you will increase the horsepower and torque to go with it. 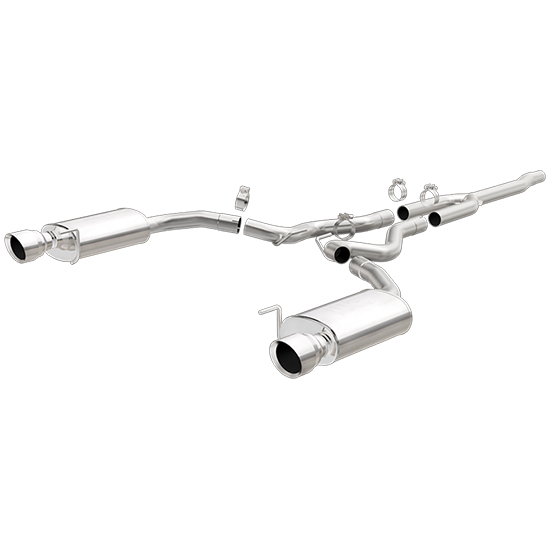 This Street Catback system is a complete bolt on exhaust kit for your 2015 Mustang. There is no welding required. With it being 100% stainless steel, you know its built to last! This catback system is a built with 2.5" tubing. The axle backs are 5 x 8 x 14" and are completed with a 4 1/2" tip. With it being a 4 1/2" tip, it fills the cut out up perfectly on your 2015 Stang. The hangers are pre-installed with the correct bends.